Zeltiq is world’s premier fat reduction laser. It works best for those individuals that have small to moderate persistent fat deposits that do not respond to regular exercise and healthy eating habits. The best candidate has only 10-15 pounds of extra body weight or problem areas. More than 20 pounds of extra body weight may require 2 or more treatments on the targeted area. The Cryolipolysis machine is like a very strong vacuum containing a refrigeration unit. A gel patch is applied to the desired area. The targeted area is drawn into the machine by a strong vacuum seal. The Zeltiq reduces the temperature of the fat in that area. Because fat freezes quicker than skin tissue, the skin is remarkably unharmed, while the fat cells are damaged and slowly die. Dead fat cells are slowly flushed out by the body through the liver, never to return. Results can be seen as early as three weeks, but more commonly, in three to four months. It is a fat freezing procedure that damages fat cells causing them to die and be eliminated from the body. The procedure is also referred to as Cool Sculpting and was discovered by two Harvard professors who stumbled across it by accident when they realized that babies given ice pops lost fat cells in their cheeks. They realized that the cold effect was responsible and started to research it. 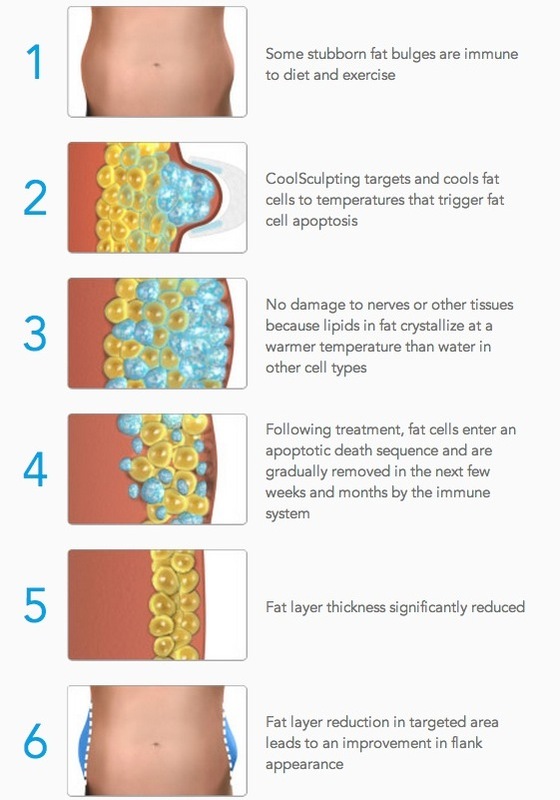 The Zeltiq CoolSculpting (Cryolipolysis) fat freezing procedure is an alternative to liposuction. It offers hope to people with small, unwanted fat deposits that are difficult to remove with diet and exercise who don't want to undergo liposuction treatment. The procedure is most popular among women seeking to get rid of their 'muffin top'... that bulge of skin just above the waist of their jeans. The beauty of the Cryolipolysis fat freezing procedure is that it is non invasive, there is no recovery period and no time off is required. There are no incisions made, the procedure is not painful while it is taking place and the only side effects are temporary redness and numbness. Occasionally a tolerable post treatment discomfort may start about three days afterward. Some patients experience a small amount of bruising caused by the suction of the machine. The reason cool sculpting isn't suitable for a large amount of weight loss is because it only addresses subcutaneous fat, the fat stored directly beneath the skin. According to researchers the technique can result in a loss of up to 1.5 inches around the waist or whatever body part it is used on. More commonly, there is seen to be about a 20% visible reduction in the targeted area. No, however it is common to feel uncomfortable as the laser vacuums up the treated area into its aperture and begins the cooling of the deeper layers of fatty tissue. It usually diminishes in about 10 minutes. After photos and measurements are done, the laser is attached to the targeted fat deposit by a gentle vacuum. It then begins to deeply cool the targeted area and damage the fat cells. It is left on the skin for about one hour. You are left comfortably resting and are able to enjoy leisure activities such as working on your laptop, watching television or reading. There will likely be a slight bulge when the laser vacuum is released but it starts to relax as soon as the laser is removed. It is common for the area to feel tender and may bruise or you may feel slight cramping. In rare cases, the cramping may be severe and start days later. Usually Tylenol will help and it doesn’t last long. After a few days the cooled fat cells begin to shrink and die and over a few months, the dead fat cells are digested and expelled through the liver.